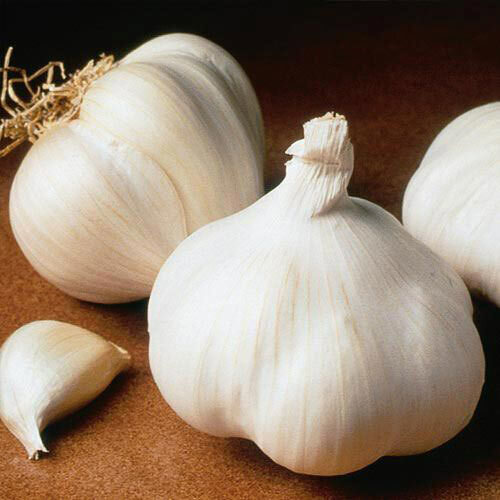 California White Garlic | Gurney's Seed & Nursery Co.
Store-bought garlic just can't compare! Large, plump softneck bulbs have papery skins and plenty of creamy-white cloves bursting with excellent, spicy-hot flavor. Easy to grow, very productive, adaptable to any climate. Cultivate and store as you would onions. Approx. 10-20 cloves per bulb. FormSoft neck, artichoke type garlic. Spacing2 - 4 inches in rows 6 inches apart. Zones3 - 9 (-30° F.). CommentsDoes well in moderate climates; cool season crop. Yield40 pounds per 100 foot row.